It is not easy defending America today. With a weak leader for president it is certainly difficult to know who will come to the aid of America. Our troops are fighting for us in Iraq, Afghanistan and parts unknown. What we must realize is that the State Department hires specially trained men to protect our interests abroad. In doing their job they protect American lives. These men who work in the shadows are the silent heroes of our time. Raymond Allen Davis is one of them. The following incident happened in Lahore, Pakistan. According to reports, Davis’ background includes 10 years in the military in the US Army Special Forces. Davis is being charged for the double murder of two Pakistan men who he claims tried to rob him. He is also being charged for possessing an illegal firearm. He claims that it was self defense. The two assailants riding a motorcycle tried to rob him at gun point and were killed during the altercation. Davis fired through the windshield and states that after the shooting he stepped out of the white Honda he was driving and photographed the men and went right back into the vehicle. He called for help and waited in vain. 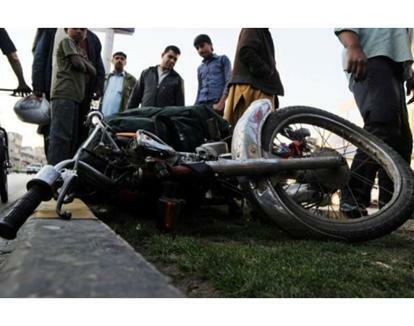 The rescue car accidently ran into an innocent motorcyclist and killed him. The men who were to rescue Davis have returned to America while Davis sits in Lahore's Kot Lakhpat Jail. The Lahore High Court Chief Justice wants to stop the special treatment they claim Davis is presently enjoying in jail. They will also decide on March 14 if Davis is to receive diplomatic immunity. Davis has been in jail since the incident took place on January 27. During his interrogation by the Lahore police, Davis tells them that he is an American and admits working for the RAO, American Regional Affairs Office, as a consultant. The interrogation seems a bit strange as Davis is not allowed to sit up and when he asks for a bottle of water he is denied unless there is an exchange for money. The State Department asked the MSM to keep silent on this but the Guardian, a British daily newspaper, released the story and the MSM followed. Since this happened there are a multitude of different stories as to the details of the case. If you read the Pakistani papers they all want Davis to die. If you read the Liberal blogs, they imply a more sinister scenario of Davis. The Pakistani men that Davis shot during the robbery are Faizen Haida and Faheem Shimshad. Both men had weapons and both had a history of petty thievery. Two stolen mobile phones were found in their belongings. All accounts relate that Davis did indeed get out of his car to photograph the dead men. According to the Guardian the Lahore Police confirmed that Davis’ photograph taken of Faheem showed that he had drawn his gun. So there is some evidence to prove that Davis was acting in self defense. The Honda windshield shows that at least five shots were fired with a possibility of seven. The Guardian claims that there were 10 shots fired. The Pakistani autopsy says that Faizen Haida had 2 in the back and 3 in the front and Faheem Shimshad had 2 in the back and 4 in the front. In the YouTube video below by a Pakistani newscast, the number of shots fired is inconsistent with the autopsy. Reading the other newspaper accounts only confirms that the truth is not being released as all of the stories have variables that are inconsistent. The State Department has advised Pakistan that Davis is indeed a diplomat and should be immediately released by the provisions of the Vienna Convention of l961. The Pakistani government is questioning whether or not Davis has diplomatic immunity. It seems that the relations between Pakistan and the US are a bit strained and the Obama Administration as yet has not convinced the Pakistan government to hand Davis over. 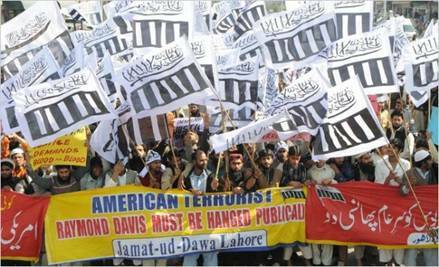 If all were well with Pakistan and the US government Davis should have been released before any trial proceedings. 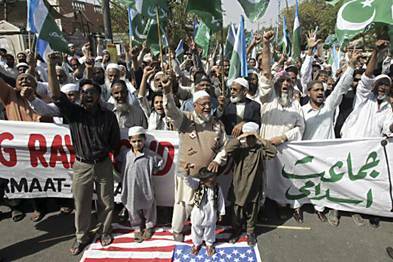 Pakistan is said to be near revolt and that if Davis is handed over to the United States it could be the trigger. It is unfortunate for Davis that he is caught in a diplomatic web. There are options that the US government can take. Stop the money flow to Pakistan to entice the release of Davis. There are also conflicting reports that Pakistan is demanding the release of a person who is presently held in the US linked to the terrorist attack in Mumbai, India. Another way would be to pay ‘blood’ money for his release. The best way, of course, would be to have Pakistan release Davis under diplomatic immunity. Let’s see who wins this ‘tug of war’. 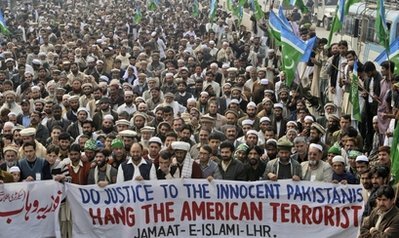 WASHINGTON – An American jailed in Pakistan for the fatal shooting of two armed men was secretly working for the CIA and scouting a neighborhood when he was arrested, a disclosure likely to further frustrate U.S. government efforts to free the man and strain relations between two countries partnered in a fragile alliance in the war on terror. KARACHI: Mystery shrouds Raymond Alan Davis, a US Citizen discovered in Mozang Chungi Lahore. Nothing appears to be clear about him. Innumerable questions with a lot of substance and reasons arise not only from the media reports, but also from the statements of the US and Pakistani officials. However, what can be stated at present with some certainty is the position in law about the status, rights and privileges of a foreigner legally living in Pakistan. According to the Diplomatic and Consular Privileges Act IX of 1972 of Pakistan, which has incorporated and enforced ‘The Vienna Convention on Diplomatic Relations 1961’ and ‘The Vienna Convention on Consular Relations 1963’, and as held in the judgment of the Sindh High Court in the case of Mrs ZA Qadir Vs Union of Soviet Socialist Republic PLD 1981 Kar-715, to successfully claim diplomatic immunity, two preconditions must be satisfied: Firstly a ‘diplomatic agent ought to be a member of the diplomatic staff’ and secondly it ought to be established that, proceedings initiated against him relates to his functions and duties as a diplomatic agent. What your stance will be on something like 'Saving Arab/Afghani lives in America' right after 9-11. Be ready to include a chapter of Raymond in your HISTORY of super heroes. He will be hanged shortly. Anyways ... your article is something to laugh about. Pull a gun on me and you are death if you do not use it. If you later changed your mind because you got scared thet I will kill you, so be it. I will pursue you anywhere you go, and as long as you are holding that gun of yours, your are a threat and you need to be incapacitated. This is our law, and we protect our lives by it. Here or anywhere else. This kind of arrogance will be brought down eventually. You are not a patriot. You are just trying to cover the fact that you are seeking an opportunity to either beat on or kill someone. KMA!